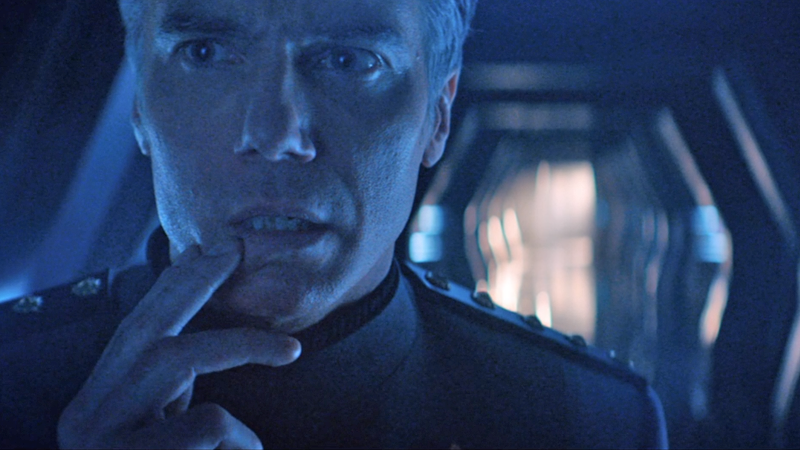 Captain Pike faces his future. Last week’s Star Trek: Discovery included a very major revelation for Captain Pike—a divisive one, depending on how you feel about the show’s relationship with its wider connections to the original Trek. But regardless of how you regarded the reveal, it’s hard to deny one thing: It took some pretty amazing practical work to achieve it. “Through the Valley of Shadows”’s time-crystal based shenanigans led to Captain Pike having to make a horrible choice. In order to secure a time crystal the Discovery crew could use in its ongoing battle against the rogue A.I. Control, Pike was forced to reckon with a future we’ve always known he eventually faces in the Star Trek timeline: suffering a horrifying radiation leak that leaves him disfigured and kept alive by a rolling life support system that, somehow for the 23rd century, only lets him communicate in beeps and boops. Pike’s tragic fate, rendered 53 years apart. Although there’s still nearly a decade to go between where Pike is in Discovery right now and the events of that accident, first shown in the classic Star Trek episode “The Menagerie,” the time crystal conceit allowed Discovery to indulge itself and present a modern, horrifying take on Pike’s infamous disfigurement. For actor Anson Mount—who has been one of the show’s greatest evangelists on social media, nerding out as he gleefully posts behind-the-scenes snippets every week—it meant going through a pretty dramatic makeup process compared to what he usually has to do to get suited and booted as Captain Pike. The actor took to Twitter recently to share his snaps of the prosthetic process it took to transform him into Pike’s “Menagerie” self, from the first steps of life-casting to the actual prosthetics being attached. And given that so much of the final product was only seen in hazy shadow as part of Pike’s perturbing vision of his future, it’s also one of the best looks we get at the final, amazing product. Complete with dog picture, to make up for the final nightmare! Although honestly, seeing Discovery’s slick take on classic Trek design just makes the idea that 23rd century Starfleet medicine couldn’t do Pike better than beeps and boops a little sillier than it was already. Looks nice though!